When I first considered the idea of switching to a plant-based diet, I envisioned a life of rabbit food ... raw carrots and celery ... morning, noon and night. Yes, I knew that it would be healthy and understood that it was better for the planet but ... the adventure didn't sound all that exciting. In truth, it was difficult to know what to eat. Searching the Internet garnered recipes containing weird-sounding ingredients and as for nutritional advice ... well, it was available but made me feel like I was "cramming" for a college course instead of cooking. Oh to have had a copy of Live. Learn. Love. Eat. 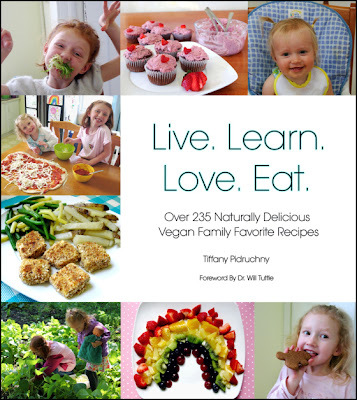 by author, blogger and a Reduce Footprints guest chef, Tiffany Pidruchny. The first few chapters offer readers information about getting started. There's a section on Protein and another about natural sweeteners. One of my favorite chapters is how to make any meal vegan ... chili, stir-fry, pizza ... you'll find advice on how to create dishes your family will love. Wondering how to stock your plant-based kitchen? Check out Ingredients and A Well-Stocked Vegan Kitchen. If you have children, you'll definitely want to read How To Get Kids To Eat Healthy and 25 Nutritious Vegan Snack Ideas (Granola bars, muffins and cookies ... oh my). The recipes are well organized, both by meal and categories such as pasta, salads, etc. I was thrilled with the breakfast chapter because, for me, it is the hardest meal to "switch over". I found delicious offerings such as Green "Eggs" on Toast, Chocolate Cherry Almond Granola and Berry Peach Baked Oatmeal. Ingredients include whole foods and products that can be found on grocery store shelves. While you might find a meat substitute, they are used sparingly. The majority of dishes are made from "scratch". But don't let that scare you ... the instructions are clear and easy to follow. 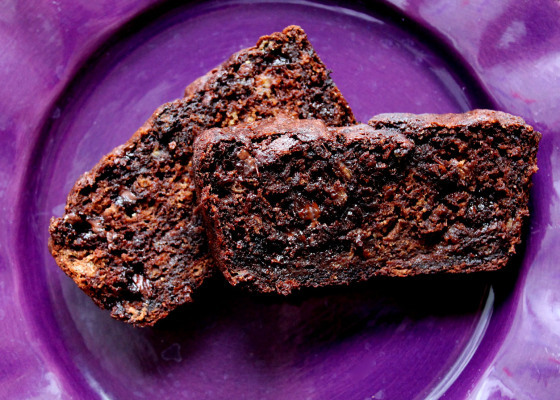 The proof of any cookbook is, as they say, in the pudding. I have tried many of Tiffany's recipes and can tell you ... they are delicious! I highly recommend this book! Ready to test one out for yourself? Tiffany has graciously agreed to let me share one from the book ... I hope you'll enjoy it! In a large mixing bowl, mash the bananas then add the maple syrup, milk, oil, and vanilla, whisking until combined. Add the instant coffee and cocoa powder and whisk again until combined. In a separate small mixing bowl, combine the flour, baking powder, baking soda, sea salt and chocolate chips. Add the dry ingredients to the wet ingredients and mix until just combined, careful not to over mix the batter. Pour the batter into a 9 x 5 loaf pan and bake for 45-50 minutes. Loaf is ready when a toothpick inserted comes out clean. If you'd like to purchase a copy of Live. Learn. Love. Eat. for yourself, send a request to Tiffany here: tiffanypidruchny@gmail.com. I received a copy of Live. Learn. Love. Eat. as a gift. I loved it so much that I asked the author if I could write a review. I received no compensation. All opinions expressed are mine and mine alone and reflect my honest opinion of the book. Our last SURVEY asked the question, "Were you raised green?" It was a close race but the winner was "Yes". The comments were interesting. In most cases people shared that they grew up in families where common-sense principles were taught ... things like conserving resources, planting food, and avoiding waste. I had the sense that regardless of when they officially began living green, their early lives paved the way. One comment suggested that green living is cultural. After a little research, I was surprised to learn that green-living is a middle-class trend. So could it be that green living and frugal living are one and the same? Perhaps what we call it is simply a reflection of how we see our place in society. So what if we removed the labels? Use LED or CFL light bulbs and turn them off when not in use. If an item has an on/off switch, turn it off ... if it has a clock or lit panel, unplug it from the wall. Unplug phones, cameras, iPods, etc. from the charger when they have finished charging. Only wash full loads of clothes and use cold water. Dry clothing outside. If you must use a dryer don't let it cool completely between loads. Take short showers (5 minutes or less) or military showers (turn off the water while lathering up & shampooing, turn it on only to rinse). Use low-flow shower heads and flow restrictor aerators on faucets. Rather than toss water down the drain, use it to water plants. Use a professional car wash instead of washing at home. Eat at home more often than eating out. Plan meals and only cook the amount of food that your family can consume. Bring a shopping list to the grocery store. Buy in bulk ... but only for items you use regularly and only amounts that can be used before spoiling. Go on a No-Spending diet. Ban single use items in lieu of reusable bottles, bags, dinnerware, etc. Walk instead of drive, take public transportation and/or carpool. Ban paper towels and napkins. Remove your name from junk mail lists. Save files electronically instead of printing them out. Value can mean a great many things. In the end, it's all about living the best life we can live with the resources we have available. How do you add value to your life in an Eco-friendly way? Last week's challenge asked us to banish paper towels. Was it easy for you? We gave them up some time ago. Old T-shirts and towels have been turned into cleaning rags and the thrift store is my resource for cloth napkins. In my opinion, the key to success is to have plenty on hand and to place them in convenient locations. They save money and significantly reduce waste. What could be better! How did Argentum Vulgaris' hamburger turn him into a fiend? And what does a BBQ have to do with cloth napkins? You'll find the answers to those questions in "Change the World Wednesday – 17th". Remember our challenge to use non-toxic cleansers? Well, Charlie got busy and wrote a whole series ... "Non-Toxic Cleaning". She includes posts on cleaning windows, fibers and woods, pets, the kitchen, bathroom, etc. In one article she offers important information on the chemicals found in typical commercial cleansers ... it's a "must read"! Did you read the "Shopping Charity" this week? I found some terrific articles including a couple written by CTWW participants. Was yours one of them? In "Time to go Paper Towel-less" Lisa took a closer look at paper towels and came up with some rather shocking statistics. Do you know what percentage of trash in landfills is paper? She also shares her strategy for switching over to cloth. Lois came up with a brilliant idea for finding cloth rags. Want a hint? What does a thrift store do with clothing that is too soiled to sell? Curious? Read "Change The World Wednesday, paper products". And I have to say, Lois, that you have some very pretty napkins for your table! Alicia had no problem with this challenge. She says, " We haven't used paper towels for quite a while. We use kitchen size terry cloth towels. We bought them in bulk several years ago and they are still holding up well.We have used cotton napkins for about 10 years now. To be honest we haven't really missed using paper towels or paper napkins. The cloth napkins and terry towels do a much better job and you can continue to use them year after year!!" By the way, Alicia recently posted a recipe for "Brussels Sprouts". If you just thought "yuck", you're going to want to check it out ... she's discovered a way to make everyone love them! Amanda is making a difference. In her words, "Trying to make more of an impact every day. We recently changed from buying bottled water to a water filter, and it not only saved money, but all the plastic that they generated decreased." Nice! Amanda is an artist and has been participating in the "A-Z Challenge 2013" by posting an original piece every day. Her work is stunning. Hop over and check it out! Clare's comment has me curious and I can't wait to read her post. She shares, "This challenge turned out to be great fun! I hardly ever use paper towels, so I thought "no problem" but your challenge gave me a renewed impetus to re-try to re-train my husband. (He's normally pretty green but not in this aspect). I was also interested to research what paper towels are used for, around the world. I'm writing a blog post, but it'll only be published by tomorrow (Wednesday) your time, sorry, I'll paste the URL once it's up. BTW, I love the new layout of your site - much easier to find everything! Thanks for another great challenge!" Re-train your husband, huh? This ought to be good! Our Twitter friend, @sunflowerhippo, shared this: "I never use those products. Destroys eco-systems, fells trees & most are koch brothers companies. 3 strikes against them"
@rulesofgreen, via Twitter, shared this "This Earth Day, Use a People Towel Instead of a Paper Towel http://www.wehatetowaste.com/paper-towel/"
And finally, check out this video by The Green Sisterhood ... recognize any faces? Trees breathe in carbon dioxide and exhale oxygen. Younger trees need a lot of Co2 to grow. When a tree is cut, all of the absorbed carbon dioxide is released into the atmosphere contributing to global warming. While paper manufacturers claim that they are sustainable, growing forests specifically for their products, they aren't sharing the whole story. Every time a tree is cut, our environment is hurt. We can help by reducing the demand for paper products ... buying less ... using less. It's a small action with a huge impact. This week, use less toilet paper. Rather than just pull it off the roll, count out no more than 6 sheets per use. If you accepted this challenge the last time we ran it, and did well, see how low you can go. If you are already a toilet paper conservationist or have switched to cloth (oh yeah, some use cloth toilet paper), please share other ways that we can conserve paper. Are you up for this one? I know that you are! Believe it or not, I wasn't always as "green" as I am today. I know ... shocking (but true). There was a time when we stopped at a local convenience store to buy a bottle of water whenever we left the house. The longer the trip, the more we bought. Not only was it expensive, it created a lot of waste! According to treehugger 40 billion water bottles end up in landfills each year. When reusable bottles first hit the shelves, there weren't a lot of options. In fact, the majority of them were made of plastic. Yes, they were BPA free but still there were concerns about recycling them at the end of their life cycle and the fact that plastic is a petroleum-based product. Today there are a number of safe, Eco-friendly and inexpensive options available ... beautiful bottles which come in a variety of sizes and colors. One of my favorites is the TAKEYA® Classic Glass Beverage Bottle. It's the perfect size for my grip ... not too wide around to comfortably hold. The silicone has a nice "feel" and keeps condensation from dripping onto the table top or my clothes. The "loop" around the neck of the bottle is sturdy making it convenient for clipping onto a backpack or bicycle. The mouth of the bottle is the perfect size for sipping. There's nothing harmful leaching into my drink. When this product is no longer useable, the materials can be recycled. Are there any concerns about this bottle? The only downside, in my opinion, is that the cap is not attached which may make it easier to lose. I should also mention that while I've been assured that the glass won't break if dropped, I really like the bottle and can't force myself to intentionally drop it for testing. I'm looking forward to enjoying my TAKEYA® Classic Glass Beverage Bottle this summer with the knowledge that it's safe for both me and the environment. Do you have a reusable beverage bottle? UPDATE (11/23/13) - Yesterday I dropped this bottle in my kitchen. It survived!! It continues to be one of my favorite bottles! I received a TAKEYA® Classic Glass Beverage Bottle in order to write this review. I received no other compensation. All opinions expressed are mine and mine alone and reflect my honest opinion of the product reviewed. You have probably heard of the Great Pacific Garbage Patch, which is the result of non-biodegradable plastic waste. Since it’s already larger than the size of Texas (a state that takes at least twelve hours to drive across) wouldn’t it make sense to reduce the use of non-biodegradable plastic? Decreasing use of anything from disposable silverware and soda bottles to sheets of vinyl used for advertising and industrial grade PVC could help slow down the growth of waste accumulated in the environment. Fortunately, there are already companies taking action to reduce the amount of non-biodegradable waste they produce. For instance, a sign company called Signazon has found a way to reduce the use of vinyl by supplying their customers with a sustainable alternative named EZ-Stick. EZ-Stick was designed so that it can be recycled and degrade naturally over time. Though it takes time to decompose, it will not remain in our landfills or the ocean forever. Adding to that, EZ-Stick is free from PVC and harmful toxins like phthalates. For those who aren’t familiar with the effects of phthalates, they have been identified as endocrine disruptors and have been tied to reproductive and neurological damage. Fortunately, the quality of the product does not have to suffer when searching for greener solutions. Not only is EZ-Stick safe for the environment, it actually turns out to be more convenient than vinyl since it allows for friendlier installation. Firstly, reusable EZ-Stick fabric decals will not wrinkle or tear so they are easy to maintain, and they can last up to 3 years without curling or losing its hold. It is so user friendly that you can remove and reposition your design hundreds of times without losing holding power. Lastly, it can be easily installed on ANY flat surface – as long as they are non-porous. This green alternative is a win-win solution for sustainable substitutes. Please spread the word about our green decal material so we can slowly wean off of buying non-biodegradable vinyl- especially when EZ-Stick better suits their needs because vinyl isn’t reusable, repositionable, or biodegradable. EZ-Stick is truly a miracle product, and Signazon is proud that they can offer it as alternatives for products like wall decals, removable decals, and decorative wall signs. It would be shame for people to miss out on this. How did your Eco-friendly spring cleaning go last week? I made the switch to natural cleansers quite some time ago. My arsenal consists of vinegar, baking soda, hydrogen peroxide and for polishing, olive oil with lemon juice. I also have some products from Etsy vendors which are basically combinations of these same ingredients with, perhaps, some essential oils tossed in to make them smell nice. Removing toxins from our life made a dramatic difference. In the past, cleaning meant headaches, nasal congestion and skin rashes ... a high price to pay for a clean home. Natural solutions have no adverse affects, they're inexpensive and they work. Good for me ... good for the planet. What could be better! In "Change the World Wednesday – 10th", Argentum Vulgaris (AV) gives us an update on his meat-free week. What do you think ... did he succeed? I'm not telling! Check out the rest of the article for a clever way to use empty CD holders as well as AV's cleanser of choice. By the way, EcoCrap has an Apothecary page with do-it-yourself recipes. It's a great resource. Lisa wrote a terrific article entitled "How Many CD’s Do you Own? – Change The World Wednesday". Did you know that DVDs are more earth-friendly than CDs? Lisa explains why. Be sure to read through the comments ... people shared some creative ways to use old discs. In "DIY Soap for the Dishawasher, The Dishes, and your Hands", Lisa tests a recipe. It seemed simple enough to make ... but did it work? You'll have to read the post to find out! Thanks to Regina McDonald for the "front page" mention in the "The artists Daily". The paper includes several interesting articles and, a personal favorite, music videos. Did you know that Mrs. Green is a published author? Oh yes ... her book, Self Sufficiency Household Cleaning is just a wealth of information. Read "How to have a green spring clean" for Mrs. Green's tips, ideas and recipes. If you'd like to download her book, you'll find information towards the end of the post. Lois shared a complete list of cleaning solutions for every part of the home. I even found an idea for spot cleaning the carpet. In the beginning of the piece, Lois talks frankly about how she made the switch to natural cleansers. It's fascinating! Take a look at "Change The World Wednesday, Cleaning House"
Have you ever heard of an enzyme cleaner? Alicia is "brewing" her own. In her words, "We made it a goal several years ago to pretty much eliminate toxic chemicals from our home. We found that a majority of them were due to the awful cleaners we were using. Alan developed a wonderful household bar that we use for almost everything. I also use vinegar and soda. This past year I had been seeing a lot of blogs sharing a recipe for making your enzyme cleaner. I know from our research that enzymes are awesome at cleaning. I just got around to making this cleaner recently and it is AMAZING!! This cleaner consists of citrus peels, brown sugar and water. It needs to ferment for about three months and then it is ready to use. I had read that you could add a couple of teaspoons of yeast to it and it would be ready to use in about two weeks. That is what I did because I didn't want to wait the three months to try it. It really is awesome. The first place I used it was on the shower walls and floor. It cuts through soap scum easily. Next I am going to try it on some shirts that have some greasy stains on them. I am now making a huge container of this and letting it ferment for the three months. That way I can compare. Next I am going to make a dishwasher detergent. I think it is time to give it a try because it is the only household cleaning product that we buy. Everything else we make. If you have never made furniture polish it is so easy to make and works great. Our daughter made a paste of white vinegar and soda to clean the oven and I was so impressed. It is spotless without any harmful fumes. Trust me you will love getting rid of toxic chemicals from your home and it is so easy to do! I am so excited for everybody to give this challenge a try!!" 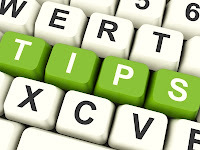 AspenClean shares green cleaning tips on their BLOG and on their PINTEREST PAGE. Have you ever used Cream of Tartar to clean? How about lemons to remove stains? These are just a couple of the great tips you'll find. For those who aren't interested in making their own products, check out AspenClean's Natural Cleaners (you can order them online). Ann stopped by. She says, "I don't have CDs or DVD, the TV and computer are my source of entertainment." Lady JC makes her own cleaning solutions. She shares, "Vinegar is a cleaning miracle! I've been making citrus cleaner by soaking orange peels in white vinegar. I let them soak in a large mason jar for around 5 weeks then fill spray bottles halfway with the solution and top up with water, shake and spray. It cuts through greasy messes in a jiffy. I also use plain white vinegar to clean mirrors, and mix vinegar with baking soda, castile soap and a few drops of essential oil (tea tree and lemon are great!) then sprinkle it in the shower to scrub the tile and tub." In "Homemade Hand Soap" she shares her recipe ... easy to make and cost effective ... perfect. By the way ... JC has a question, "If anyone knows a recipe for a cream bleach alternative specifically to clean those difficult stains on white ceramic kitchen sinks, I'd really appreciate it." Ideas? - Challenge Accepted! Bought #Italsteam Steamer that doesn't need distilled H20 & switching to #EccoFriendly detergent. Commercial cleansers are convenient and they work. But using them comes at a high cost. In addition to being more expensive than home-made solutions, they are toxic to the environment and harmful to all living things ... including us. We wouldn't dream of asking our loved ones to breathe in dangerous fumes ... and yet, that's exactly what's happening when we use chemicals in our homes. Eco-friendly options, especially those we make ourselves, are inexpensive, effective and harmless. The choice seems clear. This week (yes, one whole week) banish paper towels/napkins from your life. This includes paper towels in public restrooms and disposable napkins in restaurants. Never use them? Great, please share your tips & tricks for getting along without them. Are you with me? I know that you are! Last week we asked the question, How many CDs/DVDs do you have? These seemingly harmless discs create a lot of waste. Billions are manufactured each year. They aren't easily recycled which means that most of them end up in a landfill. We stopped buying entertainment on discs a long time ago ... instead, there are rentals available (either online or in-store) and the public library offers an ever-growing collection, free of charge. For those times when it would be nice to own, there are plenty of digital options available. That takes care of the future but what about all the items sitting on our shelves ... taking up space ... collecting dust ... and, rarely being used? Those items are being sorted out. Most will be given away via Freecycle or donated to a local charity. Alicia accepted the challenge. She shares this, "This challenge comes at a good time because we have just started to check into Netflix. Most new movies that come out we don't really care for so something like Netflix is good because we can choose from a lot of older movies also. I went through our CDs and DVDs recently and donated the ones we hadn't listened to or watched in a while. I have to admit I didn't realize they weren't typically recycled. That really gives me the incentive not to buy many of them. We have gotten where we download most music so that helps out. Thanks this challenge has been an eye opener!" Argentum Vulgaris gave us an update on reducing his water footprint. If you've been following him for any length of time, his decision will come as a surprise ... he's making a serious change which should have a huge impact. AV also talks about the number of CDs/DVDs in his home. Read about both HERE. Lisa wrote a great article entitled Ways To Reduce Your Water Footprint. It introduces a useful iphone app and offers some tips on how to improve our numbers. Lois joined us. Here are her thoughts, "I went through all my DVDs before I moved into my small apartment and recently spent an evening going through all my CDs to find what I no longer cared to listen to. I have both now stored in one CD box from Ikea but really need to go through my DVDs again as I haven't watched many in the past two years. I've passed on the ones others wanted and have a small amount, less than 10, that I will use for crafting with the little ones and to hang from our apple trees to deter deer from devouring them. Thanks for another kick in the pants to get on to that task yet again." CelloMom says, "Haven't bought any CDs for a decade, but earlier this year bought one used through Amazon's marketplace service (I also sell books through that). Yo-yo Ma's 1990s recording of Bach Cello Suites. (Of course)." La Alicia responded to CelloMom: "CelloMom -- I have that CD from years ago and still LOVE it. Over the years, I have become more and more thoughtful and considerate about what I consume and get rid of. I can always improve but I think awareness is totally the first step. Love to swap and loan with friends too." 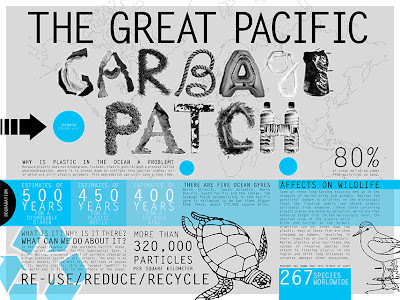 By the way, check out all the Earth Day tips on La Alicia's blog ... great stuff! EcoGrrl makes a very good point in this comment: "I moved all 300 of mine to my iPod about 5 years ago and sold 95% of them (saved my utter favorites in case of emergency iPod/iTunes failure, haha). Also moved my files saved on CD-rom over to Google Docs (my MacBook Air doesn't have a CD drive) and recycled the old jewel cases with my other hard plastics over at Far West Fibers here in Portland - they do take all those #7's and a whole lot more :) Note - it's important to remember that going digital doesn't mean you've eliminated your environmental impact - you're just transferring it to a different form - smaller yes, but still destructive. Internet use and storage takes up SO much - data centers are springing up all over my state of Oregon, on the eastern (dry) side of the state, where they are using up all the precious water to keep them cooled so that people can store their stuff online. There is definitely a negative to all of our internet use, so we need to think of the "invisible" storage of our digital files as well." Tiffany C. shares this, "WOAH! This is a super hard challenge for me. My family and I are super duper movie lovers. We have a lot of DVDs. Music CDs, not so much. I am completely digital on that front. So for DVDs, I've always thought that I would find a creative way to use the DVDs once they became obsolete. This is a great challenge and I am glad you let me know that #7 plastic is not recycled - didn't know that. Now it's even more imperative for me to find creative ways to reuse the dvds. In the future. Artwork perhaps..."
In a sweet post about feeding birds and saving landfills, Ann shares our banner. For those who wish to challenge themselves further, visit Charlie ... she has a whole page of activities with something for even the most seasoned "greenies" among us. - as always, really amazed by your challenges! I have so many DVDs and CDs can't wait to find ways to #reuse them! This challenge reminds me, once again, that living green is about every aspect of our lives. Even the small things have an impact. CDs and DVDs seem harmless until we look deeper. It's then that we see how a whole industry has been created to accommodate them ... jewel cases, racks and carrying cases ... things which require natural resources to fabricate. In the end, all that stuff finds it's way to a landfill. Suddenly those innocuous discs seem different ... they begin to look like a wound on the earth. This week, test out Eco-friendly cleansers. You can buy "green" versions or better yet ... make your own. Use Vinegar, Hydrogen Peroxide or search the Internet for other natural, homemade options. If you're currently using something which contains toxins (typically identified by the long list of ingredients on the label and warnings about skin irritation, breathing problems, etc. ), consider switching to a safer version. If you've already made the switch to safe cleansers, please share your tips, suggestions and recipes. UP THE ANTE: Dusdi Fissette (aka @dusdifissette on Twitter) says that she's already using Eco-friendly products from her cupboard to clean so she's upping the ante and asking us to use steam for cleaning. Who's up for her challenge? Ready to start cleaning? I know that you are! Before becoming vegan, we enjoyed special weekend breakfasts ... omelets, frittatas and scrambled eggs. I looked forward to these treats. Vegan breakfast options are great but ... they just aren't the same. In truth, it's been the hardest meal for me to "switch over" ... I miss those special breakfasts. My other half, "Art", is not only talented on a canvas (you can see his work HERE), he's an artist in the kitchen as well. We share cooking duties and when he takes control, amazing things happen ... like the recipe he's sharing with us today. This recipe is beautiful and satisfies my craving for eggs. It's very easy to put together. Try it for a special weekend breakfast or even a lite lunch or supper. I hope that you and your family will enjoy it as much as we do. *Rule of Thumb: You can always add but can never remove. Use enough Turmeric to give color to the mixture but not too much as it will drown the other flavors. Heat the oil in a saute' pan. Cook the onion and pepper until translucent, about 10 minutes. Add half of the tomatoes and continue to saute for about 5 minutes. Now comes the fun part. Rinse the tofu and then squeeze it with your hands, letting the tofu spread through your fingers. Continue squeezing it until the texture resembles scrambled eggs. Be sure to break up any big chunks. To the sauteed vegetables, add the crumbled tofu, turmeric, garlic powder, salt and pepper. Continue cooking until the liquid has evaporated. Taste, taste and taste again, adjusting the seasonings as necessary. When you're satisfied, remove from heat and add the remaining tomato. Mix well. Transfer to a serving dish and top with cilantro and a sprinkle of paprika. 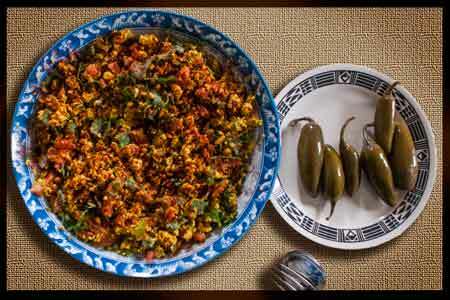 Serve with dill pickles, pickled jalapenos or a tomato and onion salad. You can add mushrooms to this dish. Use a small amount (about 1/2 cup), chop and add during step 1. Add some Textured Vegetable Protein (TVP) to make the dish heartier (recipe follows). Add it in right after step 4 and heat through. For a slightly different flavor, try adding some capers. Add them in with the tomatoes in step 2. Try adding some cooked, diced potatoes for a skillet breakfast. Add them in after step 4 and heat through. Cover the TVP with water and soak until completely hydrated. Drain and squeeze out any liquid. Repeat 3 times. Once the TVP has been squeezed, place it in a bowl with all of the remaining ingredients except the oil. Stir well. Add enough water to cover the TVP and soak for at least 15 minutes. Lightly oil a frying pan and add the TVP mixture. Cook until all liquids have evaporated and the TVP begins turn brown. Taste the mixture and adjust seasonings as necessary. Transfer the mixture to a lined cookie sheet and bake in the oven, at 400 degree f, until the mixture is crunchy and resembles fried, crumbled hamburger. Be sure to stir occasionally so all sides are toasted. This usually takes about 15-20 minutes. This mixture is wonderful in the above recipe. It's also good in tacos, salads or any dish which calls for browned hamburger. To maintain it's crunchiness, do not add it to liquid ... it'll rehydrate and become soft. If you're adding it to a dish like stew or spaghetti sauce, add it at the very end or serve it separately to be added at the table. Try adjusting the seasonings adding cumin to make it more Mexican or oregano to make it more Italian. It's a very versatile product, packed with protein. Thank you, Art, for sharing your recipes with us today! Last week we took a look at our water footprint, specifically our indirect water use. What a fascinating and educational exercise. While the calculator wasn't a complete picture, it certainly gives us a place to start. To my surprise, coffee and tea are my top "offenders". Grains/cereals also came in high. Armed with that information I began doing comparisons, searching for options with a lower impact ... I'll be choosing those items on future shopping trips. Janet accepted the challenge. I loved her comment, "Very interesting to see that the actions we take to reduce our indirect water usage is also healthier for us. It confirms the interconnectiveness of everything - healthy people, healthy planet!" Ann included our banner in this interesting post entitled Save the world: charging customers for window shopping. Argentum Vulgaris calculated his water footprint and posted the results. Can you guess his numbers? On the plus side, he lives alone and is very frugal ... on the other hand, he eats meat. So what do you think? Find the answer HERE. Lisa had a great comment, " Why...why...why do I know about this only now? I am totally in!" Alicia joined the fun and had this say, " Wow it is amazing to see how much water usage it takes for the foods we eat each day. Several years ago we cut our sugar consumption down by at least 75% and when we do use sugar it it evaporated cane juice instead of white sugar.Really we cut out pretty much everything "white" as in white flour, sugar, rice and pasta. Anything that I know that has been bleached we don't eat! I am so glad that we don't eat meat. I know that the corn they feed the cows causes methane gas which is so harmful to the environment. I didn't however know about the water usage associated with meat. Another good reason not to eat it! We drink green tea over coffee and eat lots of fruits and veggies.I know this is considered direct water usage but we always have a big garden each year and this past year by the middle of the Summer we started having drought conditions.We bought a stand sprinkler system to help water the plants so they would not dry up. In this process we more than doubled our water bill! We said if that ever happens again we will be better off to save the water usage and just go to the Farmers Market and buy our produce. We probably could have purchased all the veggies for the price of the extra water usage and saved the water as well. Lesson learned. I had no idea of the water it takes for grains, meats and sugar. Just goes to show how there is so much more that we all need to educated on. Thanks for this great info!" Lois is in. She shares this, "I try to watch every drop of water being used, but will use this to tweak a few thing in my diet as well." We have a new participant this week ... a big welcome to Kaye Brennan of Elkieb's Weblog. Kaye wrote a lovely post entitled Walking with purpose has opened my eyes. It shows what can happen when we pay attention to our surroundings. By the way, Kaye is a campaigner and administrator for the Woodland Trust (the UK's leading woodland conservation charity). There's a lot of great information on that site about how we can protect our forests, no matter where we live. So if you get a chance, check it out! Katie calculated her footprints. She shares this, " I have never thought about my water footprint. How neat! Dairy was my highest category, followed by meat (even though I'm vegetarian). The calculator didn't consider fish, unless it's counting fish with meat." I'm curious Katie ... how does a vegetarian have a high meat count? I'm guessing that you have some meat-eaters in your family. Betty Manousos dropped in ... so nice to see you again, Betty! Intricate Knot also stopped by ... thanks, IK! Scarlet accepted the challenge and said this, " Water waste is something most of us rarely even think about. I'll definitely be more conscious of how much water I use every day." After reading this challenge, Kris wondered about the water footprint of Easter candy. Click HERE to find out what she learned. Kristina used the calculator and was surprised. She shares this, "Wow. I can't believe how much water meat takes! I have cut back quite a bit already and it was still my highest category by a long shot! Need to rethink that one." Lady JC accepted the challenge. She shares this, " Thank you! The calculator and figures you gave us are such a great tool. I think we often focus on direct use like showers, or water for household tasks, but the indirect water consumption has en even bigger impact. We're doing well in the food (and transportation) as the bulk of our intake is organic fruits, veggies, tea & grains, and we only take the subway. There's always room for improvement in the goods we choose to purchase or not purchase so I think that will be my focus as well as finding creative ways of using water more conservatively now that the gardening season is upon us. Thank you so much. Great challenge!" - Walking with a purpose for #CTWW: Sadly, every time we walk our dog we're picking up trash discarded by motorists. It's easy to reduce the impact of the things we see on a daily basis ... or the things which result in a bill at the end of the month. It is, however, only a part of the story. When we take a look at the natural resources used to produce our food or fuel our cars ... when we know the true cost of our clothing, our coffee and everything we touch ... we begin to understand the true nature of our impact. That's the story we must concentrate on ... and improve. When the book on our environmental history is finally complete, what will your chapter say? This week, apply the three R's (Reduce, Reuse and Recycle) to CDs, DVDs, Blu-ray Discs, etc. Reduce - Rather than buy, consider other ways to listen to music, watch movies, play games or obtain software. For example, listen to the radio or find your favorite station online ... borrow from a friend or the library ... download software from the manufacturers site ... rent from places like Netflix, RedBox or Blockbuster. If you must buy, consider buying second hand ... check thrift stores, garage sales and stores like GameStop ... or browse online shops like Wherehouse.com or Spun.com (please note ... I've never used these online sites so use your best judgment when buying/trading through them). Reuse - Donate discs to a charity or your local library. Give them to a friend who might enjoy them. Sell them. Get creative and find new uses for obsolete discs (reflectors in your garden, bookmarks, coasters, wall art, etc). Recycle - Discs are considered plastic #7 which is a general category of miscellaneous plastics and typically isn't recycled. Some recycling companies will take them so check with your waste management service. If your service doesn't accept them, check out Earth 911 for online recycling services.